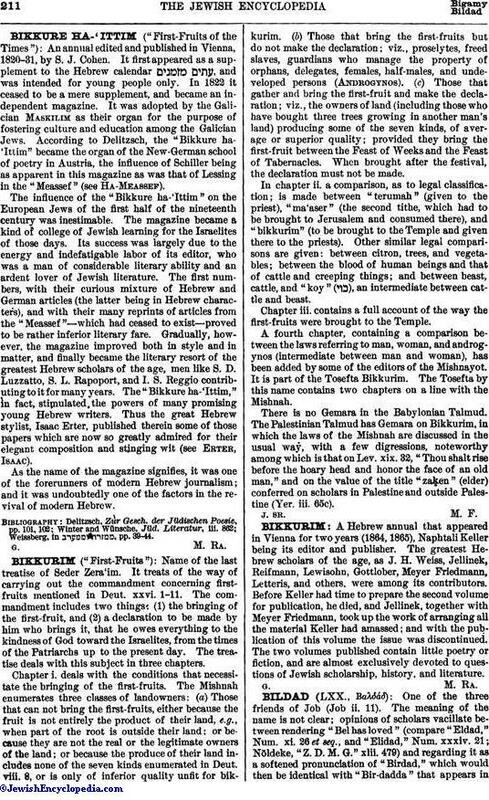 A Hebrew annual that appeared in Vienna for two years (1864, 1865), Naphtali Keller being its editor and publisher. The greatest Hebrew scholars of the age, as J. H. Weiss, Jellinek, Reifmann, Lewisohn, Gottlober, Meyer Friedmann, Letteris, and others, were among its contributors. Before Keller had time to prepare the second volume for publication, he died, and Jellinek, together with Meyer Friedmann, took up the work of arranging all the material Keller had amassed; and with the publication of this volume the issue was discontinued. The two volumes published contain little poetry or fiction, and are almost exclusively devoted to questions of Jewish scholarship, history, and literature.